One of the marvelous joys of a lunchtime stroll around Edinburgh City Centre for deerhound loving humans, is the fact that one is never more than a few minutes from either a piece of Art or a Sculpture featuring the Scottish deerhound. A simple visit to the National Galleries for example will bombard the senses with Scottish Life reflected in art from throughout the centuries. Scottish and International Artists having captured many scenes from the Scottish countryside and Scottish Artist using Scottish experience to depict legend and history from around the world. 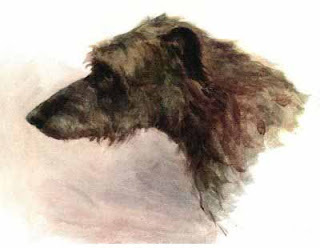 A particular favourite which deerhounds and their fans can enjoy has to be Young Romilly from 1863 by Alexander Munro. A Marble at a height of: 97 cms it is quite beautiful. Munro translated the naturalistic detail and engaging narrative of Pre-Raphaelite paintings into sculpture. Here the young boy, William of Egremont, and his long-haired greyhound (We know it’s a deerhound, the Rogue), are poised on the brink of a chasm, about to plunge to their deaths in the River Wharfe. Munro was inspired by Wordsworth's poem 'The Force of Prayer' which recounts the legend of the founding of Bolton Abbey in Yorkshire in memory of William, 'Young Romilly'. Herbert Ingram, founder of the 'Illustrated London News', allowed one of his young sons to pose as William, so Munro carved the Ingram coat of arms on Romilly's tunic. Munro was a gifted sculptor associated with the Pre-Raphaelites. 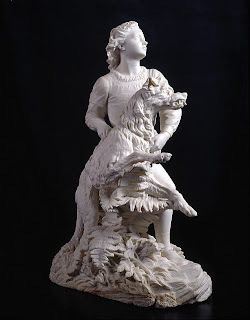 Originally from Inverness, his talent was evident in the early clay models he made, which brought him to the attention of Harriet, Duchess of Sutherland. She introduced him to the architect Charles Barry who had designed the new Houses of Parliament. He invited Munro to London to work on the sculptural decoration of the Parliament building. Munro accepted and also enrolled at the Royal Academy Schools, where he met Rossetti, Millais and Arthur Hughes. Munro shared a house and a studio with Hughes for six years. Should you visit Edinburgh, a visit to the Galleries is highly recommended - simply click the Gallery links above for information and enjoy the amount of hounds you will discover. And you can be sure that you will find much more in the way of hound art and histories here in coming blogs. Oops! oor hoose forgot to post the Deerhound club membership dues - hey! it happens near every year - it’s aboot time we payed by Direct Deerhound Debit - well, my respect for banks makes me think - maybe not - I’m a dog! The cheque is in the post - and because - money can’t do anything to perfect the most perfect creature of heaven - here’s another portrait for deerhound lovers to enjoy. And when love is not madness, it is not love. Valentines Day Deerhounds - Love to All! 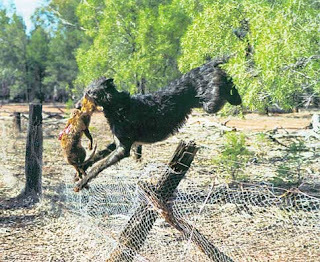 As a celebration of the day of love – the Rogue of love here, thought he would post up some special deerhound footage for all to enjoy. As part of the ongoing Scottish Deerhounds in the movies, we have an excerpt from the Sally Potter depiction of the Virginia Woolf novel, Orlando. The Song featured was recorded by the Corries and not from the movie but it is entitled ‘My Love She’s but a lassie yet’. Suitable for todays blog in more ways than one. Interestingly the tale Orlando has been described as "the longest and most charming love letter in literature." as part of its suggested reference to it having been written for Virginia Woolfs lesbian lover Vita Sackville-Wes. 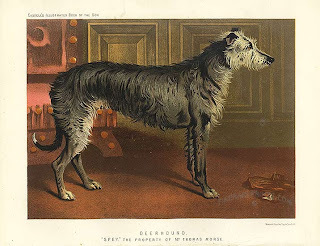 Virginia Woolfs life tale is one of mixed fortune and psychological turmoil - but that’s no’ for deerhounds, so just click the link to find out more from Wikipedia should you be interested in the authors life. As for the deerhounds in the movie - Queen Elizabeth I of England played by Quentin Crisp walks through the Royal Gardens accompanyied by Orlando, played by Tilda Swinton - Somethin’ tells me as kin to these Scottish Deerhounds, that as lovers of Queen Elizabeths far more beautiful half sister, Mary the Queen of Scots, one can sense that they want to be running through the Glens and Forests o’ the Bonnie Highlands. That aside, the movie is rather sumptuous having been shot on such a low budget and 10 week time frame, and having used locations in cities as far afield as Constantinople and Khiva in Uzbekistan. I would recommend a viewing of the movie as rare enough are the deerhounds featured in the picture shows and what’s more its a LOVE story - so enjoy. And as an extra wee love token from Scotland - Here are some Love songs free in mp3 format from the Scotsman newspaper Heritage site. Love to you All from Rogue. Just the other evening, I was helping sort through the big box of collected prints and posters from beneath the bed, as the household bedroom carpets were about to get the shampoo make-over. 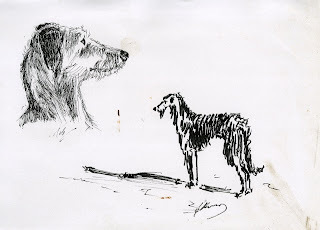 That’s when I discovered some copies of old sketches penned by Ricky for the deerhound club newsletter about 12/15 years past. Although a couple appeared, many did not, so where better a place to use them than here on the blog. Here is a sketch of Ardkinglas Uncanny as a pup and Brodie of a Summers Evening. When the hound mood takes – I’ll blog up more renderings. In the meantime the carpets have been shampooed and upon the first being cleaned, I immediately walked into the empty room and left a pawfect pattern around the perimeter. The carpet was re-cleaned - but I haven’t been allowed back in to check it over yet. Although I’m quite sure this shot was not taken at Holyrood in Edinburgh - home to the Queens Official Residence whilst in the City and location of the devolved Scottish Parliament - I feel it may be, what I as a deerhound would rather have at the location of Holyrood. The photograph comes from the Hounds of Hollyrood Kennels website (visit and browse), located in Kampaloops, British Columbia, Canada. That’s Hollyrood with a double El. I cannot vouch for this kennel still being active as their webpage has not been updated for some time. 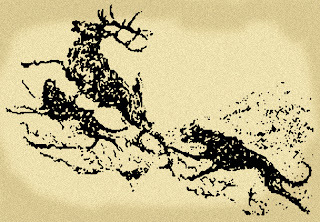 It is also possible the image may have come from Australia as other images on their fun page feature deerhounds in pursuit of a Kangaroo. A rather large rodent not indigenous to Canada. One thing I do believe is that the shot captures the grace, power and hunting reality that many with deerhounds may never witness during their ownership of the hounds. And although we are not Foxhounds as such - Hey! when the chase is on, who knows what we may pursue? Infact over the last two evenings during my midnight walk, I myself, inadvertantly discovered a fox coven and set off in pursuit of the sly old creature whilst it was out for a quick supper take-away - haven’t caught one as yet and perhaps I don’t really want to because the chase as all hounds know is the fun part. My human companion may beg to differ on this as he ends up calling and searching as I devilishly take forever to return from the dark of night. 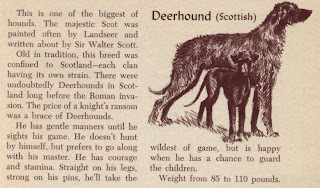 Sticking with todays earlier post (see ‘Deerhounds in print from 1881’ below), it seems essential to include this image of Spey - need I say more? 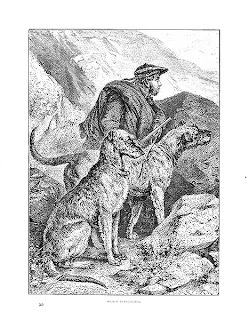 This original antique print is from the renowned "The Book of The Dog", published by Cassell in the late 1800s. The color printing was of an exceptionally high standard and, most importantly, the illustrations contained within feature some of the finest portrayals of dogs. 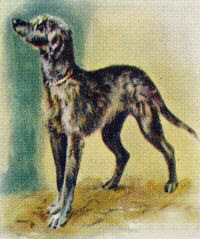 It contained the first color illustrations of the Bedlington Terrier, Dandie Dinmont Terrier, Irish Terrier, Yorkshire Terrier, Fox Terrier, Pug, Italian Greyhound, Cavalier King Charles Spaniel, Irish Water Spaniel, Dachshund, Basset Hounds and Retriever.